The English Club of the KV Basle was founded in 1872, to give the members of the KV Basle an opportunity to use their English. The Club is no longer restricted to members of the KV. We're a motley crew that has one thing in common: the love of the English language. We come from different countries as Switzerland (most of us) but also Germany, Japan, Venezuela, Finland... and we all want to keep our English up-to-date. Everybody is welcome, we cater for all levels except absolute beginners. 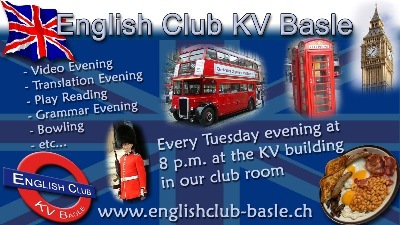 Usually, we meet at the club room of the KV Basel at 8 pm every Tuesday except school holidays. You find this room if you enter the KV building, walk along the corridor with classrooms no 10 to 13, turn into the corridor on the right, go downstairs and enter the first room on the left.